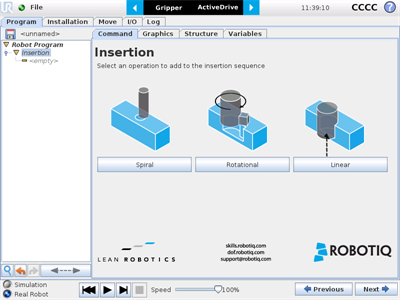 On August 8, 2018, Robotiq launched version 1.5.0 of its FT 300 Force Torque Sensor URCap (UCS-1.5.0) for CB-Series Universal Robots (PolyScope 3.6). It boasts the same reliability, and includes new application-oriented features. Browse to the support product page of the FT Sensor to download the URCap. The Force Torque Sensor URCap Package includes the Insertion node, which can be used to perform spiral, rotational and linear movements to insert objects in holes or bores, or to make contact with a surface. 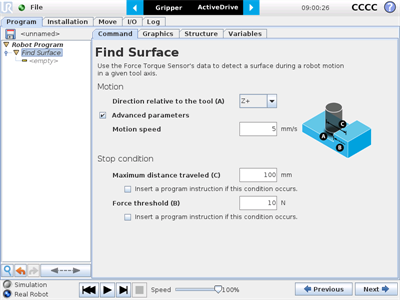 It is an essential integration resource for streamlining robot programs in the framework of precise assembly applications. When the task is performed by a human operator, the operator's fingers provide valuable feedback through the sense of touch, thus allowing the human to detect any resistance when trying to insert a pin in a hole, for instance. To a certain extent, the FT Sensor gives that kind of sensitivity to the end effector. Below are the different options available when inserting an Insertion parent node. Following a contact established between the object grasped by the end effector (or the end effector itself) and the corresponding mating part or surface, a spiral motion is engaged on a specific plane to find the path of least resistance according to the direction, speed, force, radius increment per turn and maximum radius parameters set by the user. Following a contact established between the object grasped by the end effector (or the end effector itself) and the corresponding mating part or surface, a spiral motion is engaged around a specific axis to find the path of least resistance according to the direction, speed, force, maximum torque and maximum rotation angle parameters set by the user. Following the successful spiral, rotational or fortuitous location of a mating hole or bore, a linear motion is engaged at a certain speed until the force threshold or maximum travel distance is reached. The Find Surface node is a great tool for machine tending and various other applications that require repeated accurate positioning of objects. The latter two are known as stop conditions. Ticking their corresponding box creates child nodes packaged as If statements. The user can define the next course of action in the program, e.g. a gripper open command after the force threshold is reached, or a move to the initial position after travelling to the maximum distance. Contact [email protected] should you have technical questions regarding the FT 300 Sensor and its software. Is there a way to use the Linear-Insertion also in 3D? So that the Robot adjust X,Y;Mx,My while inserting in Z. Is that only posible by using Force-Control? Up to now, you are right, it can only be achieved by Force-Control.